Travel accessories company releases ultra soft, sustainably sourced comfort collection. Sourced from responsible and renewable resources, Lewis N. Clark’s new BeWell collection offers a new take on traditional comfort products. Many of the materials, such as bamboo, naturally possess ultra soft, moisture-wicking, and anti-bacterial properties that keep travelers comfortable, and they also incorporate sustainability into their design by requiring less energy and water to grow. BeWell provides a variety of options, including a memory foam neck pillow, adjustable neck pillow, eye mask, contour eye mask, packable blanket, and comfort set. 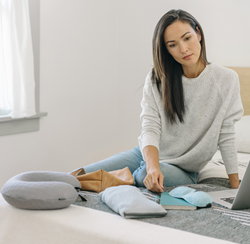 Both the pillows are customizable, with the memory foam pillow changing according to body temperature and the adjustable neck pillow inflating to the wearer’s preference. The blanket and comfort set can be packed up compactly so they easily fit into luggage. The eye masks effectively block light and allow travelers to sleep on airplanes, trains, or wherever they need to catch a bit of shut-eye on the road. The BeWell line of neck pillows, eye masks, and blankets promotes traveling well, resting well, and being well on the go. Lewis N. Clark is dedicated to offering travelers and adventurers everything they'll need to remain comfortable, safe, and organized on their trips. For more information, visit http://www.lewisnclark.com.